We use it on regular basis; it conveniently helps us to transfer files from desktop to/from laptops or even share its content with our peers. It makes life easier. But wait, have you overlooked its threat to our computer? If the USB flash drive is infected with virus, not only you may lose the data in the storage, you are also affecting the security of every computer once it’s plugged in. The following post features a list of 10 tools to protect your computer against any infected USD flash drives. Prevention is better than cure, and it’s never too old for that saying. Full list after jump. Note: It’s strongly not recommended to install multiple tools in the same computer for various critical reasons, just try and get what really suits your needs! USB Disk Security provides protection against any malicious program trying to attack via USB flash drive. It delivers high level of protection against theft and accidental disclosure of confidential data, and prevents unauthorized person from stealing your data. 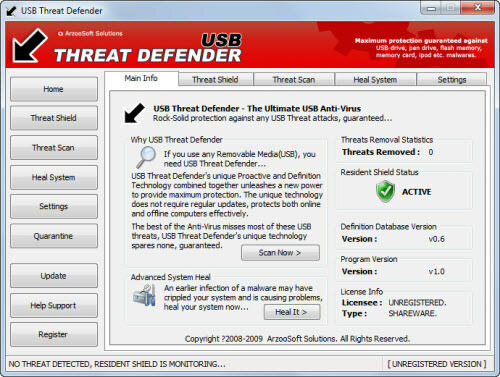 USB Threat Defender is not just another autorun.inf virus remover, it takes more than that to provide maximum protection guarantee. Its new protection level detects viruses missed by the best antivirus software, and provides maximum protection against any threat that tries to attack a system via any USB storage device. 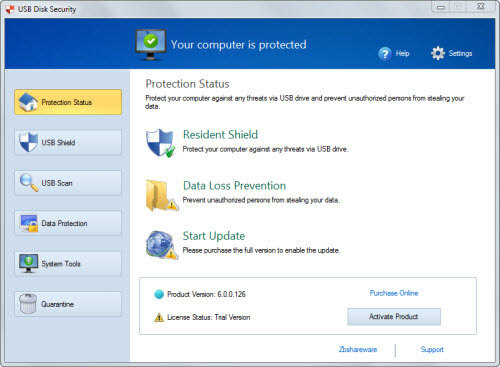 Proven antivirus security for your USB drive. Automated, daily antivirus updates install silently in the background, ensuring your USB drive is always protected from evolving and emerging virus threats. The software does not provide trial version, but considered it’s the famous brand McAfee, it’s probably worth your consideration! And did I mention 30-day money back guarantee? 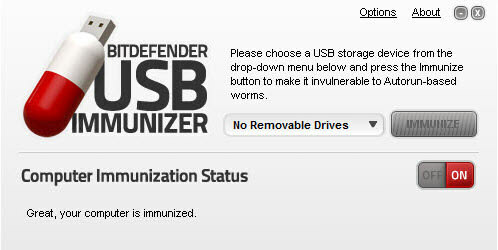 The Immunize option allows you to immunize your USB storage device or SD card against infections with autorun-based malware. Even if your storage device has been plugged into an infected computer, the malware will be unable to create its autorun.inf file, thus annihilating any chance of auto-launching itself. 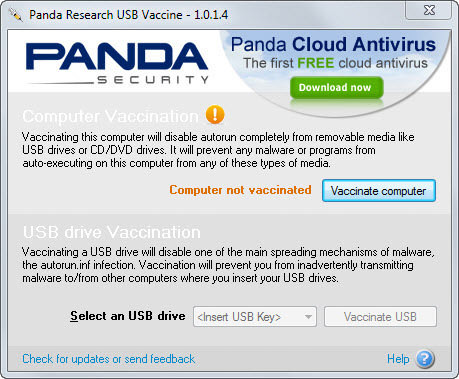 Panda USB Vaccine can be used on individual USB flash drives to disable its autorun.inf file in order to prevent malware infections. When applied on a USB drive, the vaccine permanently blocks the malicious autorun.inf file, preventing it from being read, created, deleted or modified. 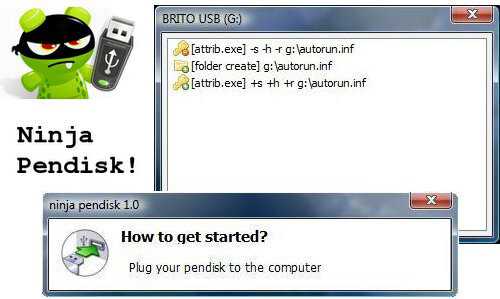 Ninja is the popular and free program designed for guarding computers against viruses transmitted by USB pendisks. This ninja waits quietly in the system tray until an USB pendisk is plugged into the computer, which it will be examined to uncover the commonly malicious or virulent files known as autorun.inf and ctfmon.exe amongst many others. 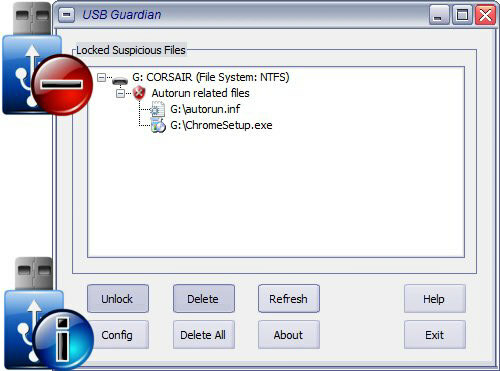 USB Guardian allows you to safely enjoy file sharing with USB thumb drive. Movies, MP3s, documents and pictures can be copied from one computer to another without worrying of getting infected by worms and viruses trough USB drive. 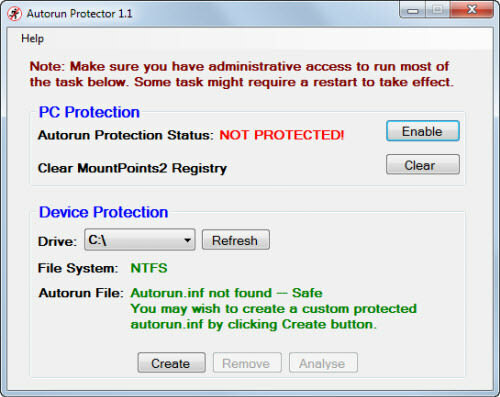 Autorun Protector is a two-way protection standalone software that prevents your PC from infection by autorun worms and also protects your removable device from being infected from other sources. Hence, it decreases the spread of the virulent worms. Autorun Virus Remover uses proactive technology to permanently remove autorun & autorun.inf viruses, also it can block those viruses trying to infect the system via USB flash drives. 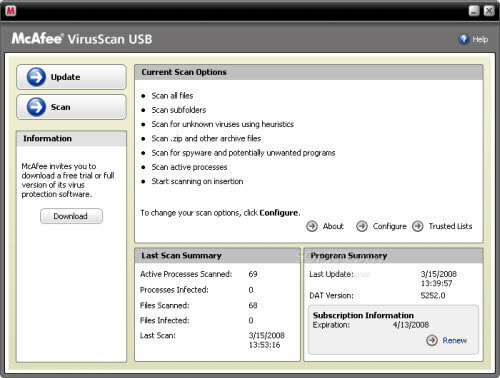 The USB Program is designed to help prevent computers being infected by autorun viruses. The program is loaded into system memory, and technically it automatically renames autorun.inf files on new device into autorun.inf_current date_time, and sets its attribute to “normal”, making it visible for the system. As a result, it isolates any infection.